One of those mornings that somehow let the light in, but without a trace of sun. I leave tarmac behind, entering a dirt track with my low clearance hatchback, carefully avoiding the trenches deeply rooted by combine harvesters. Going over the side corrugations, I wonder if they have used the snow groomer to flatten this section of the track? Some 40 km north of Belgrade, Serbia, I am driving to the very end of an oxbow lake with the intention of looking for the Ruddy Shelducks (Tadorna ferruginea) that were found here the day before. I already have a history of searches for this species. Actually, when I started to bird, my second ever duck, after the Mallard, was a Ruddy Shelduck! At the Danube in practically downtown Belgrade – how odd is that? Well, too odd to be countable. I was in a kayak, the duck was some 4-5 metres from me, easily tolerating my interest for some 5 minutes or more, implying that it was almost certainly an escapee. Reaching the end of the lake, turning back and… %54#$%#”3&$1!!!!! I am stuck in the mud! There was no visible mud, but I should have known better than to enter the few square metres of a white salty crust. Yes, it was hard enough for me walk on it, but obviously not hard enough to drive on it. And now, one wheel is deep in it. 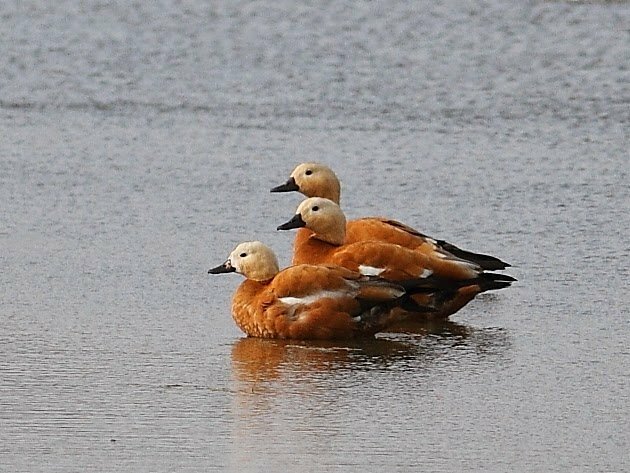 Ruddy Shelducks do not normally show up in Serbia. They range from the eastern outskirts of the Balkans (while Serbia lies in the centre of it) all the way to Indochina. But Serbian medieval folk songs do mention them! Do they? They do mention the “utva zlatokrila” (golden-winged duck), but do we know which species did they meant? Some experts are almost certain that the name was used for Mallard and not shelduck. The very moment I got stuck, I found myself surrounded with a swarm of mosquitoes. I carried insect repellent with me for a better part of the year, and a week ago decided that there was no further need for it, it is autumn already, so I left it at home. And I could swear – they knew it! Some ten years ago, I almost found Ruddy Shelducks near Bodrum, in western Turkey. “Almost” here means that I missed a dozen strong flock by a mere half an hour. And finally, a few years back, I got them in India – at every other wetland. The wheel is turning without traction. So I turn the engine off. There is not a soul around me. To calm my nerves, I mount the scope onto the window clump and observe my first Great Grey Shrike of the season. In a quarter of a century of my birding life, not a single wild Ruddy Shelduck has been seen in Serbia. And yesterday, Ceda Vuckovic and Zoran Manasijevic found three of them here! Having a sip of coffee, watching the shrike and thinking how to get out of this mess… rubber floor mats! I use heavy duty rubber mats usually found in lorries and SUVs (a good choice for a birder) and am pushing one under a sinking wheel. Turning the key… still no traction! Since I have created this mud puddle by sinking into it, it surely has steep walls. I try to reach Ceda by phone, but when I naively switched my mobile back to factory settings, I lost quite a few numbers, his among them. The puddle has steep walls? But I have a collapsible spade in the trunk! A bit of shoveling… turning on the engine… with no effect. Minutes long as hours. Not a soul around me. Finally I manage to reach Ceda. He doesn’t know anyone from this village who has a tractor! Perhaps some acquaintance of acquaintance of yours, after all, you do live in the second village from here? I have solved nothing, but still, I know that Ceda will not leave me in the mud. There is one more tactic that I haven’t tried yet, the best and the riskiest one. If I do not get free, I will get very seriously stuck. Forward, backward, forward, backward… and after some time I am on a hard soil. Despite being heavily coated in mud on both sides, the floor mat has lost half of its thickness through traction with my tire. The car is dirty up to the windows, I am well covered in mud – but free at last. And determined to find those Ruddy Shelducks! Driving back along the lake, scanning the surface… a combine harvester is coming my way, so I park in the grass by the dirt road, to give it enough space. A bit later, there is another combine, then a tractor hauling a trailer, another tractor, another and yet another tractor, and after them, a Lada 4×4! Where were you half an hour ago??! Soon, I found three large ducks on the water, but as soon as I come closer, they took flight, like proper wild ducks. It happened once more and I gave up disturbing them further – I have seen what I was here to see. In the end, were they escapees, or the real McCoy? 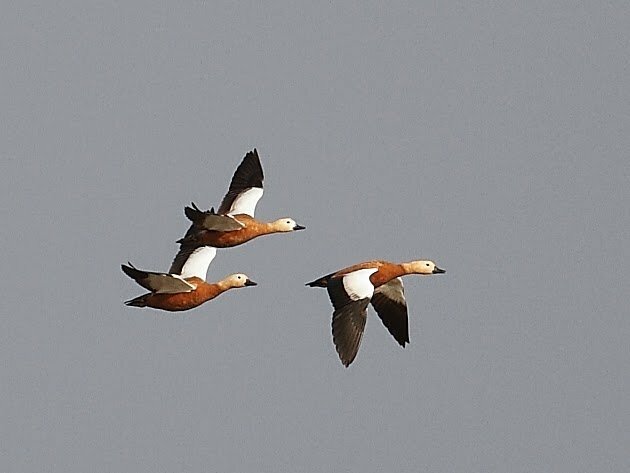 Further north, in Poland, they used to write off all Ruddy Shelducks recorded, assuming they were escapees, until they found one ringed in Kazakhstan! If I haven’t had the chance to observe the tame escapee before, perhaps I would be in doubt, but these birds had proper survival instincts of wild ducks and I am convinced, as much as I possibly can be, that they are the real McCoy. Photos were made the day after by Slobodan Panjkovic. Dragan Simic is obsessively passionate about two things – birding and travelling in search of birds, and that has taken him from his native Balkans to the far shores of Europe and the Mediterranean, southern Africa, India and Central America. His 10,000 Birds blog posts were Highly Commended in the International Category of the 2015 BBC Wildlife Blogger Awards. Birder by passion and environmental scientist by education, he is an ecotourism consultant, a field researcher and a bird blogger who always thinks that birding must be better behind that next bend in the road, and that the best bird ever is – the next lifer. Thank you for this post. Ruddy Shelducks are really beautiful birds! I saw my first ever in mid-October in La Granja, near Segovia, Spain. It was swimming in a canal with a few Common Pochard ducks and a swan, and I wondered where it came from. A silly idea: perhaps some of those escaped and well established feral birds around the Baltic Sea have developed migratory habits, joining and following other waterfowl? I had to go all the way to Kazakhstan to see Ruddy Shelducks but it was totally worth it! Great post and good work getting out of the mud! So far, my birding highlights of a lifetime were mostly along the Tropics, both of Cancer (India) and Capricorn (Botswana), but yes, I have heard of Kazakhstan enough times to keep one eye on it, just in case some opportunity arises. It is so worth going. Even the European birders I was with were loving it, as birds that they only dreamed of having show up in their countries were relatively easy to see. Especially Black Lark. They were loving the Black Larks. Kazakhstan is one of the world’s great birding countries. You should actively make some opportunity arise. And great post on the Ruddies. Here in Germany, we have so many (“countable”) ferals that the magic of a genuine vagrant is sadly lost. Are You Going to the 2015 Space Coast Birding and Wildlife Festival? Where Are You Birding This First Weekend of November 2014? Bag Limit? We Don’t Need No Stinking Bag Limit!